Before the first presidential debate was even underway, viewers received their first taste of sexism directed at the former secretary of state. Yet another commentator — this time, a CNN host named Michael Smerconish — advised Hillary Clinton to smile more when debating Donald Trump on Monday night. How many times must women remind men that they are, in fact, not required to smile, and that they don't owe it to the public to walk around grinning? How many times must women demand that what comes out of their mouths is more important than whether or not their mouths are smiling? Even Clinton, who on Monday evening became the first woman to stand on the general election debate stage, couldn't escape this tired, sexist trapping. Smerconish made these comments long before either of the candidates even had a chance to take their podiums on Monday night. Likely, Clinton was backstage, preparing to address the nation on topics such as job creation and national security. But no matter — Smerconish already had the perfect debate prep advice for the highly accomplished candidate. "I would say, search for a moment where you can insert a little bit of levity," advised Smerconish, on the eve of a historic debate that happens to include a candidate who has promised to build a border wall and assassinate the families of suspected terrorists (you know, real light stuff). "Don't be afraid to smile." He went on to say that the debate rules, which dictate a complete lack of audience participation, would likely benefit Clinton, as Trump tends to appear more animated. Unfortunately, Clinton is no stranger to this type of sexist remark. The former secretary of state is often told to smile more, and everything from her clothing to her hairstyle are frequent topics of so-called political commentary. Aside from quips about his comb-over, Trump rarely receives the brunt of that type of scrutiny. Rightfully so, the focus on the GOP nominee lies in his policies — at least half of this election cycle seems to have been devoted to debunking and commentating on many of Trump's repeated falsehoods. So, here is some advice for Smerconish, in response to his unsolicited opinion: Afford Clinton that same type of attention. Treat her policies and her resume with the same scrutiny that you treat the state of her mouth. If you're going to give her "advice," advise her on how you think she should beat Trump on facts, on policy, on clever rhetoric. Hillary Clinton is not here to look pretty and pleasant for you, she is here to win an election against a dangerous candidate. Tonight is not about her smile, it's about her ideas and her experience. Smerconish's words reflect a larger problem for female politicians, and the above advice to him should be relayed to all pundits addressing all female candidates. Female politicians are more likely to be critiqued for their looks, and how closely their physical appearances hew to cultural ideals of attractiveness plays a more significant part in their electability. Female politicians with "feminine faces" are more likely to be elected, female politicians face far more attention paid to their wardrobes and hairstyles, and overweight women rarely bother to run for office at all. Even the mention of a female candidate's appearance, though almost unavoidable, can kill her chances at election. This repeated "advice" comes at a high price, both for the candidate and women at large. 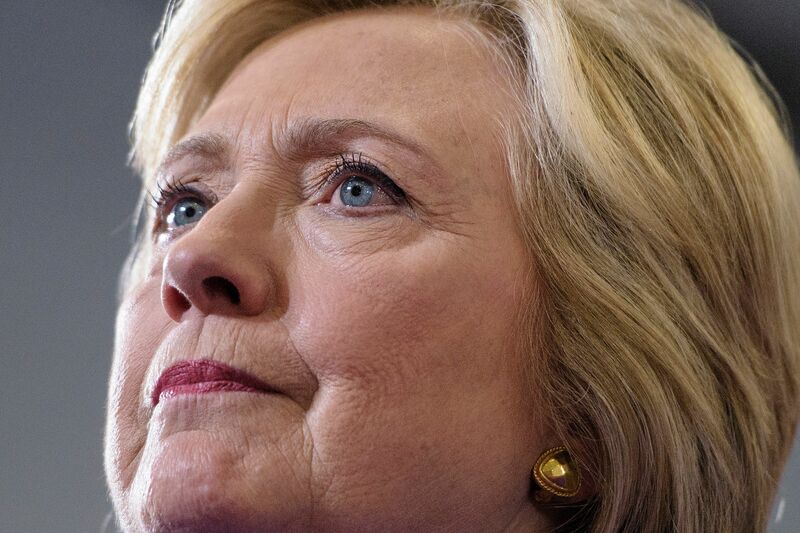 While Clinton's outstanding political career continues to be dogged by sexist rhetoric, it also tells women that no matter how big the stage is, they will still be judged by their physical appearance. What's more, as a political commentator, Smerconish is clearly well-versed in the gravity of the evening's debate. This type of rhetoric merely distracts both Clinton and the public from the serious issues at hand. And that's nothing to smile about.